Over time, a once-challenging strength-training routine can start to feel, well, routine. It turns out, your muscles can feel the same way, too — and you’ll stop seeing results because monotony has led you to plateau. Fortunately, you can end the stalemate and hone your workout plan and continue striving toward your goals. Here are eight ways to do it. It seems counterintuitive that ceasing to workout could help you get more toned and fit, but your body needs time to repair and renew itself between exercise. Taking some time off gives your system the time to do that. You might want to skip a day at the gym between workouts, or mark out an entire week on your calendar wherein you don’t exercise at all — not even cardio. Not only will your body have plenty of time to restore itself, but you’ll feel refreshed and motivated when it comes time to return to your fitness routine. Variety is the spice of life, they say. Apply the same wisdom to your workout — especially if you’ve hit a plateau — and you might just start seeing results again. A new move, even if it trains the same muscle group, will challenge your body in a new way. For example, this is why many athletes spend at least some time training underwater, through swimming and other resistance exercises. This will help build strength in different areas of the same zone, thus helping yourself break free from a plateau caused by monotony. Cardio workouts strengthen your heart, bulk up your immune system and help you lose weight, among other benefits. However, too much time spent sweating on the treadmill, bike or elliptical can get in the way of your strength-training goals. For starters, cardio plus weightlifting can lead to over-training, which will stress your body and potentially cause injury. On top of that, cardio burns so many calories that your body might not have the resources to replenish itself, rendering you unable to grow and tone muscle. Most gym buffs will know precisely what a superset is, but, just in case, here’s a refresher. A superset includes two workouts to either challenge the same muscle groups or work opposing areas. Superset exercises are performed in a circuit, one after another, before you rest and repeat. This could pose a new challenge, especially if you’re performing a workout in a traditional, compartmentalized fashion. To that end, if you’re already super-setting, you can up the ante by increasing the weight and decreasing the reps to less than 12 total for each exercise combined. The heavier weights you lift, the more benefits you’ll reap — namely, your muscles will grow larger and more defined in a quicker timeframe. Some athletes swear by active recovery, gentle exercises that help restore the body without over-stressing it. Water-based workouts go easy on the body while still presenting the challenge of resistance. You can do a slew of exercises in the pool, too, from leisurely swimming to water aerobics to underwater treadmill running. You might even want to try plunging into alternatively hot and cold pools, as this practice has been shown to hasten muscular recovery, too. Sleep is a vital part of your fitness routine. Think about it — a bad night’s sleep means you won’t have the energy to get to the gym or perform your workout with zeal. A sleepless night can even lead to a gym-based injury if you’re too exhausted to find the right form, lift a heavy weight, etc. Sleep also helps preserve and grow muscles. As you rest, your body releases hormones including testosterone, a vital part in the building and re-building process. Finally, when you’re caught up on sleep, you’ll have less ghrelin in your system. This hormone makes you feel hungry even if you aren’t — a common sensation when you’re exhausted, as you may know — so rest up and watch your routine really work. Sometimes, your results have stalled because your workout is no longer a challenge for you. The rest-pause method will fix all that by pushing you to perform each exercise until you’re burned out. But that’s not all — you’ll pause once you’ve done the most repetitions you can, regain your energy and then do another set. You can repeat this until you feel you’ve fully worked the muscle group. Then, try the rest-pause method on a different area. You’ve probably heard the saying “abs are made in the kitchen.” Healthy nutrition is a vital part of your fitness routine, and, if you’re not eating well, it could be impeding your progress, no matter how hard you’re working out. That’s why you should learn which foods to eat to build your muscles. Note which ones make you feel your best and which yield the best results over time — hopefully, those two categories coincide. Of course, you indulge and enjoy all types of food from time to time, but a well-formulated diet can help you carve the silhouette you envision. A plateau doesn’t have to be a bad thing — it can be the impetus to improve your fitness routine further and, therefore, your health. So, try switching things up with the above eight tips and see how your body responds to the changes. 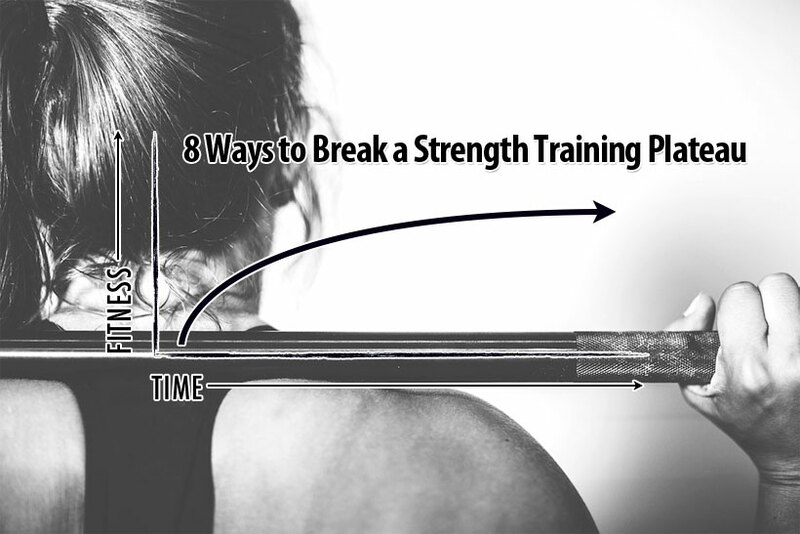 Spoiler alert: you might begin seeing even more muscles start to poke through.